Sony's vision for the future of gaming is here. The Console: The PlayStation 4 will be powered by chips that would make any top-of-the-line PC user drool: A "supercharged" x86 processor, a PC-style graphics processor, and eight gigabytes of RAM. With these guts serving as the PS4's central brain, the console is capable of pushing some truly stunning graphics. It'll likely be ready for the next five to 10 years of living room display technology. Sony didn't actually show off the console itself on Wednesday. It will likely show that hardware off at the E3 video game conference in June. Social integration: Impressive as the graphics are, the real leaps made by Sony were found in the PS4's ability to share content. 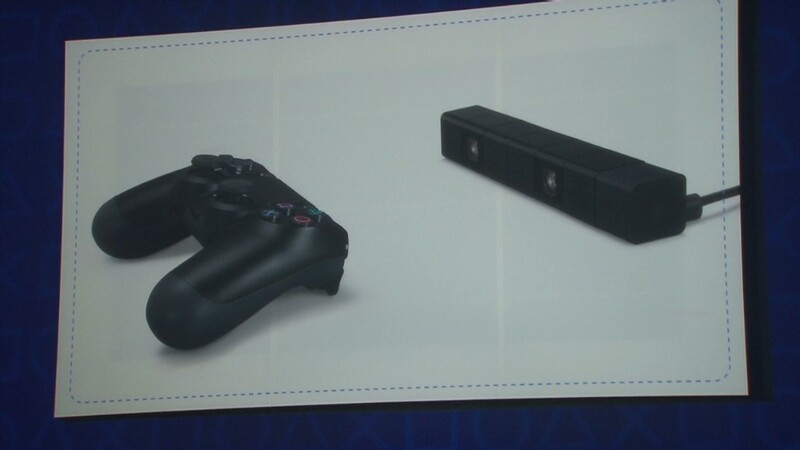 The PS4's controller features a share button. When pressing it, users can share clips of the last few minutes of their game play and even broadcast real-time gameplay to friends. In some instances, friends will be able to communicate with one another and even remotely take over others' games. The PS4 also features social networking integration and personalized recommendations for downloading games and media. Sony will allow users to log into their PlayStation profiles on phones, tablets or PCs. The Controller: Like every other iteration of the PlayStation controller before it, the PS4 controller didn't get too much of a makeover, but it packs a few new tricks. The new DualShock 4 controller sports a touchpad placed smack in the middle. Along the bottom is a 3.5mm headphone jack for connecting a headset, and along the top is a glowing, colorful LED light strip that will identify a player. The Network: More than ever, the PlayStation network is emerging as a central priority for Sony. And its plans for the PS4 are big. The biggest announcement Sony made Wednesday was that users will be able to "stream" PS4 games to the handheld PS Vita. But Sony doesn't want to stop there. Eventually, Sony says it will enable cloud gaming, which will allow users to play every title on any system, streamed from remote servers. The Camera: The PS4 features a built-in camera for 3D tracking and motion control, similar to the Microsoft (MSFT) Xbox's Kinect attachment. The Games: We're still a ways off from knowing what will be ready in time for the PS4 launch, and what will come after, but Sony already has a couple of big titles lined up. Developers showed off first-person shooter game "Killzone: Shadow Fall," team-based online racing game "Driveclub," and "The Witness," a puzzle solving game. "Beyond: Two Souls," a game developed by Quantic Dream, was particularly impressive. The game will feature up to 30,000 polygons per video game character. That delivers as close to a photorealistic video game experience as we've seen. Sony said every major third-party partner is on board with the PS4, including 185 different studios. The Release: Sony didn't say what the price would be, and it hasn't given a firm release date aside from "the holiday shopping season." In other words, expect the PS4 sometime around November. Correction: An earlier version of this story incorrectly stated the name of the video game unveiled by Quantic Dream as well as the resolution of each video game character.